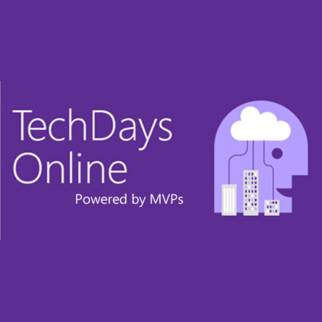 This is the sixth article in a series which explores the SharePoint 2010 MySite features. This article will discuss the approach taken to use the MySite as the centre of the intranet. To understand how to approach using the MySite as the homepage we need to examine the distance and control of information for a user. 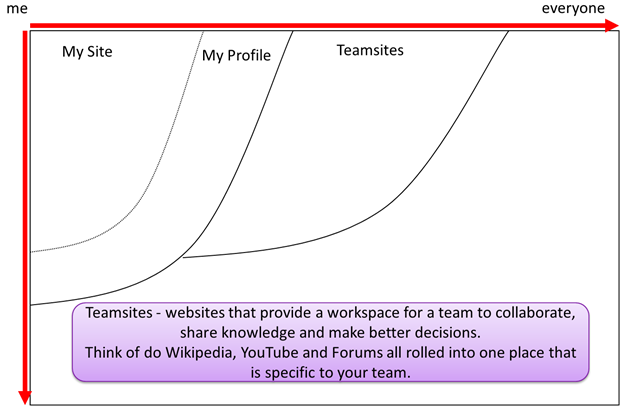 This will help to explain the compelling reason for using the technical MySite approach as the homepage for the intranet. The following diagram all follow the same theme, you as the user is the top left. As the axis moves further to the right the information is consumed/shared with more people. As the axis move down from ‘Me’ that user has less control of the authoring and creation of the information. First is the MySite. Here the user has full unlimited control to the information and functionality available. The concept is similar to that of iGoogle where a use can add the widgets to the page they want. This section is not really consumed by other people and is really about that individuals context. Second is the Profile. This again is closely controlled by the individual user but starts to have outside influence from such things as HR or Active Directory entries. This information begins to be used and consumed by other people. This in concept is similar to a LinkedIn or Facebook profile. Third is Team Sites. This is where an individual use begins to collaborate or consume information shared with more people. Examples might be Wikipedia, YouTube and forums. Forth is the Community Sites. 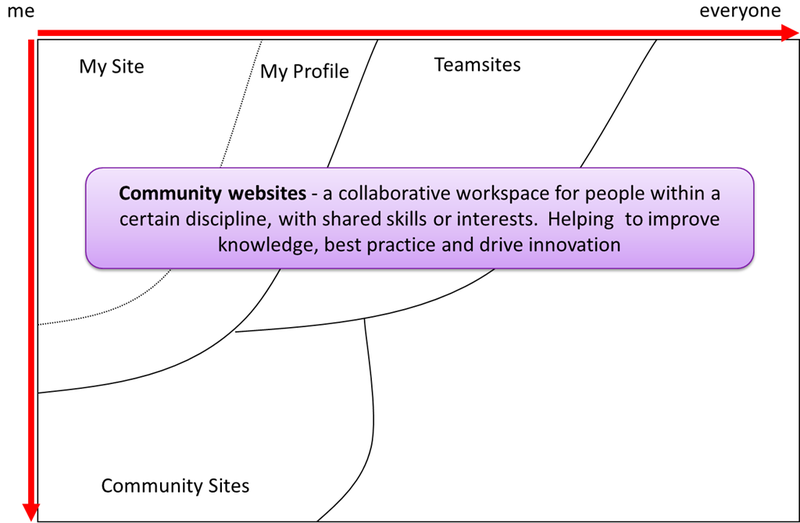 These sites move away from the traditional organisation team/unit and more towards natural work team sites. Again these are collaborative consume and contributed to by many. Fifth are the Corporate Sites. 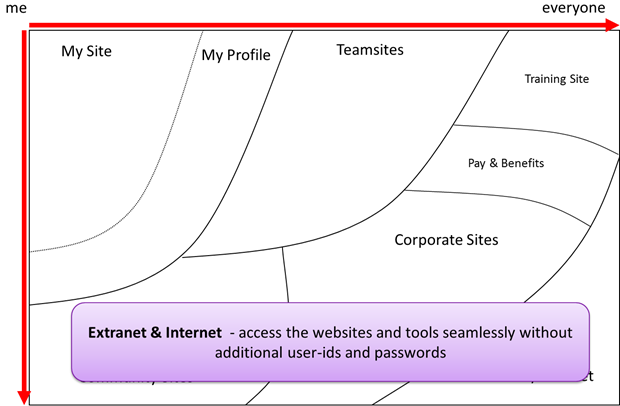 These sites are what can termed the ‘traditional’ intranet. The sites are authored by only a small number of users and consumed by many. This is normally where Marketing and Internal Communication sites are located. Sixth is External access. While not technically a content section the ability to access the platform from any location is important to the user. 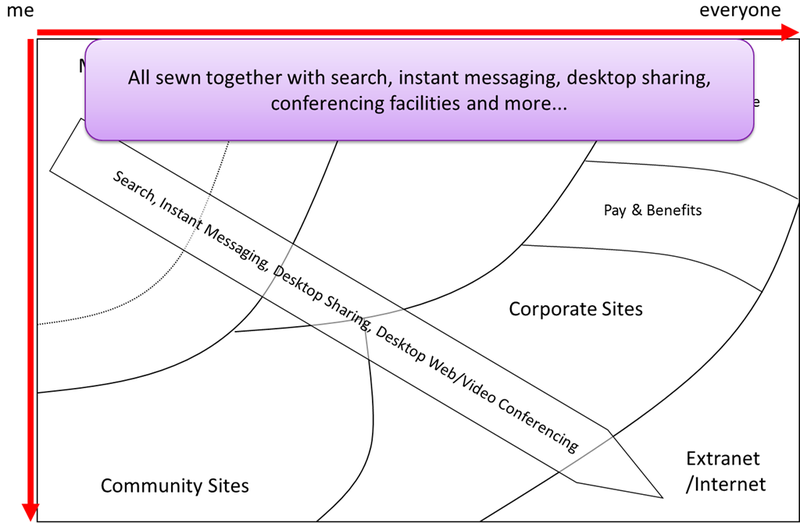 Finally are the Search, communicator and desktop sharing capabilities which should underpin the entire platform. So that wraps up the MySite series. Hopefully this has shown how the MySite is constructed and how it can be customised in a supportable manner. And finally how to view its positioning in the information architecture design for an intranet platform. Excellent series of articles. I was wondering if you answer a question that I seem to be having problems with at the moment. I want to use some of the web parts that exist within the MySite, on the homepage of a team site. I thought that this would be a striaght forward task, SharePoint know who is currently logged in, so why why should it not be able to display the recent activities of the user, or display the user collegues. The activity feed web part should work anywhere within the sites, it will display the same info as found on the newsfeed page on the MySite host. You might have to import the web part definition from the MySite host web part gallery into the team site web part gallery to have it available in the ‘adding’ mechanism. As for the user colleagues i’m afraid i’m not so sure about that one. Let me know which web part specifically is not working and i’ll take a look when i get some spare time. 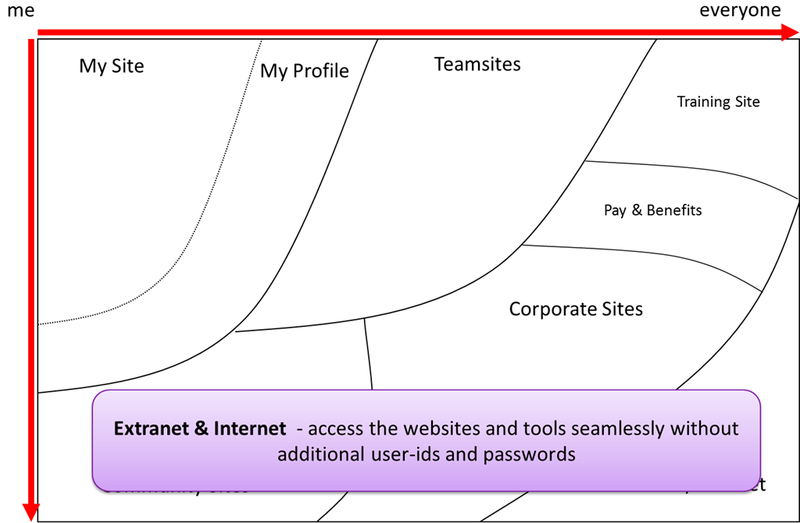 My organization are discussing some Intranet features like ”My IT Workspace”, a collection of sites / webparts that holds information regarding the coworkers personal IT workspace (an example would be a webpart for ordering / installation of applications). 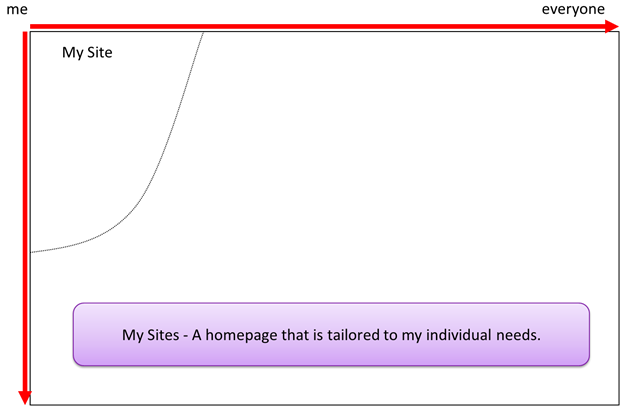 From your experience would this best be deployed as a “Site” or be a part of the MySite (perhaps as a new tab)? Without knowing the full details it’s hard to comment. 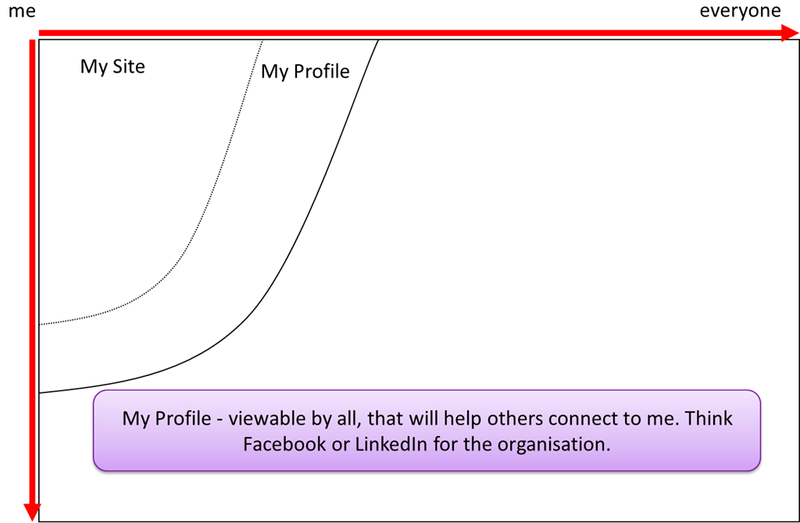 If you wanted each user to personalise the page then put it in their personal MySite. If not then where you locate the page is really down to your choice. I have gone through all SIX parts and found them interesting to learn and use. 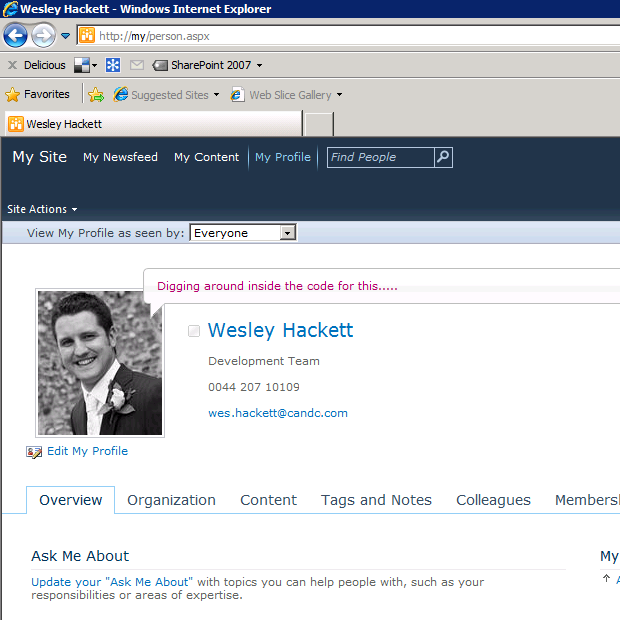 I want to customize the MySite default page’s webpart called “Whats’s new”. This needs to accomodate the POSTs and Comments for each one of the Feed that the user sees in that web part. 1. I want to post to the user news feed. 2. Each post be able to receive comments. 3. Adds the comment in the ‘Recent Activities’ web part of the user’s My Profile page. 4. These comments can have multiple comments on it. please recommend how do I go ahead with that. There are activity feeds API available but i need what level of customizationis required here? Could you please reply to my post? I need some suggestions from you on this. Nice — but what about the impact on platform. What sort of thing are you interested in regarding impact? Is there a name for the technique you used in those graphs? Interested in learning that a bit more. That technique is a ‘Social Platform’ approach. This is the design technique employed by my company for all SharePoint platforms.